Protect your brand, improve lease conversion and increase retention—all from a single dashboard. A local SEO and online reputation monitoring platform that makes it easy to oversee all your locations, assess your reputation risks and opportunities and take action. Online reviews are everywhere and are being consumed by prospects at every stage of their apartment search. E marketer research states that consumer reviews are 11 times more trusted than descriptions from brands. This means that if you’re not proactively managing reviews you could be losing prospects before they ever walk in the door. 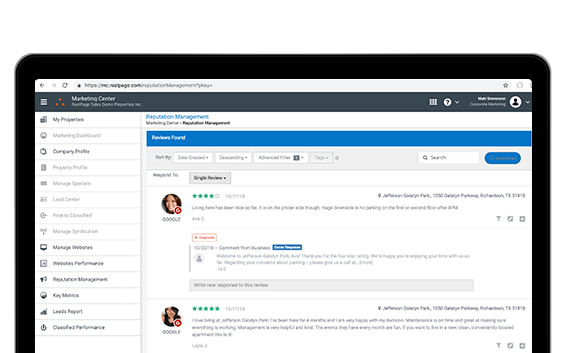 You can monitor and respond directly to reviews on Facebook, Google, Yelp and ApartmentGuide.com—right from RealPage’s Reputation Management. The Review Response Template feature makes follow-up efficient while maintaining a consistent brand voice—for individual or bulk responses. Our sophisticated Sentiment Analysis algorithms automatically characterize online reviews according to the nuanced judgments reflected in their content, providing you with another window into how your customers are feeling about your property—making it easy to take action quickly. Reputation Management can help you identify image posts that pose a brand risk or opportunity for your property. You can monitor and act on geo-tagged images and/or video that do not reflect the brand or voice you are trying to maintain. And you can promote positive images and videos to your social profiles. Media showing negative feedback or questionable behavior can be flagged for follow-up by your staff. And you can even train the platform to tag images by region, brand, location, date, and provider for more efficient media monitoring. Our Customizable Local Brand Visibility (LBV) Score gives you a quick benchmark of five key areas to create a unique score: Reviews, Social, Listings, Search Ranking, and Competition. This helps you identify the high performing areas and which areas could use improvement. Ensure accuracy and consistency of your business listings with the only platform that integrates powerful local listing accuracy tools into a multi-location reputation management system. It’s easy to add more keywords, categories, and other details to your property’s local business listings, helping you achieve even more with minimal effort. 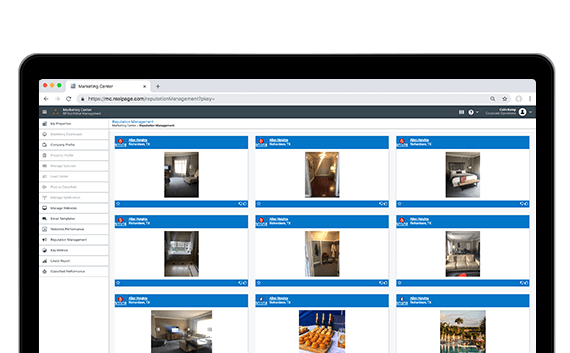 Real-time integration with RealPage Marketing Center makes it easy for you to keep your property or portfolio’s business listings up-to-date from one location. One Marketing Center login grants easy access to Reputation Management, property data, property/company settings and more. Monitoring posts, images, videos and reviews can be overwhelming. 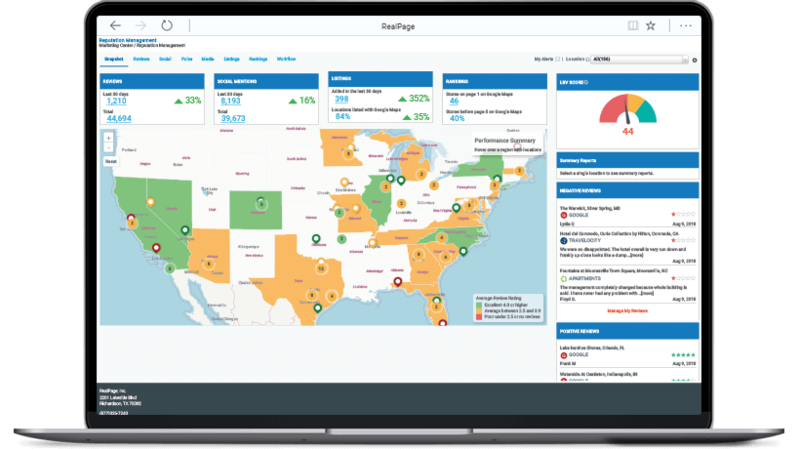 By upgrading to RealPage® Reputation Management Pro, our experts will do the work for you, monitoring and managing the online conversation about your brand so you can focus on what you do best. We’ll respond to your worst critics and encourage your biggest supporters with the perfect blend of professionalism and expertise. Go Pro and get results. A Fogelman Properties study found that communities with a higher approval rating also enjoyed a higher net closing ratio, lower turnover rates, fewer canceled applications, higher renewal increases and higher average rental income increases. Property managers need to efficiently benchmark and measure social brand reach and sentiment over time, at both portfolio and property levels, because of the growing importance placed on reviews by consumers. In fact, 56 percent of consumers now select a business if it has positive ratings and reviews in the Google Local Pack. 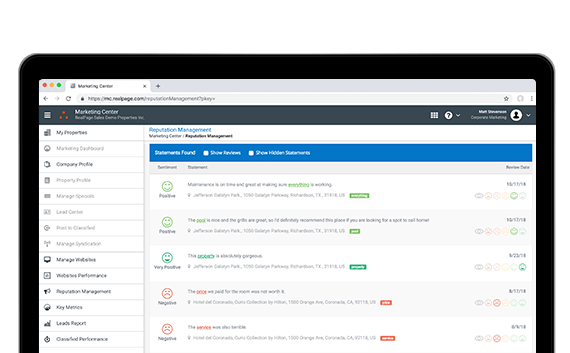 RealPage Reputation Management allows you to create and maintain a consistent brand reputation and marketing efforts that attract and engage prospects and renters all from one, unifying dashboard. This will allow you to help your properties humanize the online experience, build credibility among residents and most importantly, foster loyalty among fans, followers and reviewers. Monitor all your locations, assess your reputation risks and take action. Manage reviews, update property listings and engage prospects and residents on social media to help drive lease conversions. Directly influence renewal rates by highlighting positive reviews and resolving negative reviews. Student renters demand more service with less interruption.